Machine Embroidered Quilting and Applique Traditional quilting is turned upside-out! "I'm so excited to share my book, Machine Embroidered Quilting and Appliqué with you! Designs in Machine Embroidery is excited to bring you the first in a series of DVD's that will get new multi-needle embroiderers off to a great start and build confidence in seasoned embroiderers. Embroidery expert Deborah Jones takes the mystery out of stabilizer. She puts in plain words exactly how to stabilize even the most "scary" fabrics. 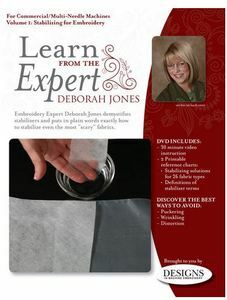 The 30-minute DVD is in chapters so you can watch the whole thing or quickly navigate to the exact spot that covers the fabric and stabilizer for a specific project. Handy printable reference sheets are also included on the DVD. How to stop puckering even in the middle of a stitch-out! Dime PPK0010 Perfect Placement Kit: 15 Templates, 36 Stickers, Ruler, 20 Page Book, for 4x4 Inch Hoops* It Can't Be This Simple!